Scree: the generated scree dots. Scree Polygons: the polygons that are filled with scree dots. Gully Lines: flow lines extracted from a digital elevation model. Obstacles Mask: No scree dots are placed where this mask is black. Shaded Relief: Modulates the size and density of dots. Gradation Mask: Where this mask is dark, the contrast between bright and dark slopes is enhanced. Large Stones Maks: Dots are enlarged where this maks is dark. Reference Image: An image that is not used for generating scree dots. 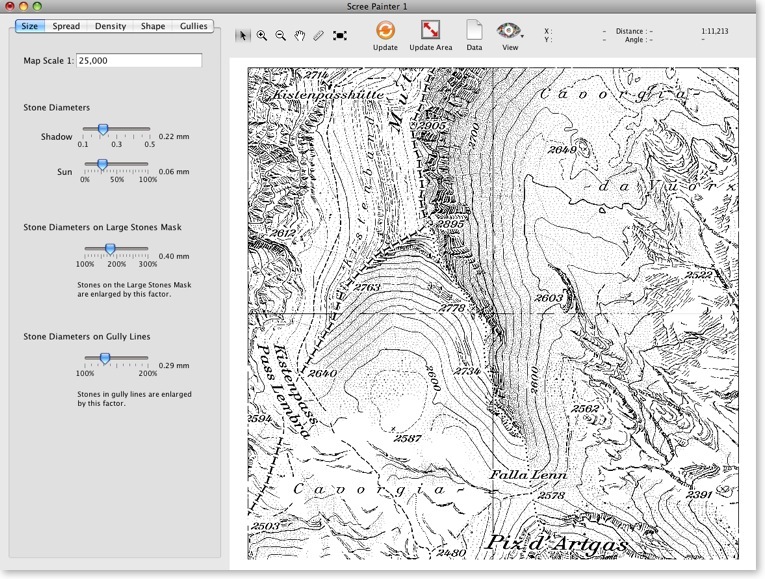 The reference image included in the sample data sets shows a map section with manually produced scree dots for comparison. Read more and download application at ScreePainter . . .